Raymond James Ltd. is one of Canada’s leading full-service investment dealers. With the recent acquisition of 3Macs, a respected independent investment firm founded before Confederation in 1849, we’ve become Canada's largest independent investment dealer with more than CDN $38 billion in client assets under administration. We have been recognized as one of Canada’s Top 100 Employers in 2016 and 2017 as well as one of BC’s Top Employers in 2017. Criteria such as physical workplace, work/social atmosphere, health/financial /family benefits, vacation/time off, employee communications, performance management, training/skills development and community involvement were evaluated. Employers were compared to other organizations, and those that offered the most progressive and forward-thinking programs were selected. Our main branch in Kelowna houses a dynamic and diverse team of leading financial advisors dedicated to making a difference in the lives of our clients and our community. With all the advantages of an independent business model supported by an experienced management team, we offer the perfect environment to meet our clients’ unique financial goals and objectives. We are committed to staying true to our core values of conservatism, independence, integrity and putting clients first. Raymond James Cares Month, held annually in May, is an initiative that inspires employees to volunteer and help out in their communities. Our branch is proud to emulate this “culture of caring”; we embrace the spirit of social responsibility and giving back to the communities in which we live and work. Another corporate initiative, the Annual Giving Campaign, encourages colleagues make a difference by raising funds, as individuals or through fundraising events, which are then matched by the Raymond James Canada Foundation. Our main branch’s signature fundraising event, Christmas in November, has raised over $100,000 for local charities since its inception in 2014. With a focus on purpose, this year’s BDO Leadercast caught the attention of Interior Savings. "We are so pleased to be a sponsor of Leadercast and to help spread the message of purpose," said Gene Creelman, Interior Savings Senior Vice President of Member and Community Engagement. "In today’s environment, we all want to deal with businesses and people we can trust and who operate according to shared values. Being able to clearly articulate and live by one’s purpose is essential for today’s leaders." Since its inception in 1949 through to today, Interior Savings has focused on putting people before profits and building strong communities. According to Creelman "Interior Savings is rooted within the fabric of the towns and cities we call home. Our cooperative values drive us to look for opportunities to create partnerships and make a difference. After all, we’re only as strong as the members and communities we serve. When they thrive, we thrive. This is why local matters and this is why purpose matters." In the past 15 years, Interior Savings has awarded over $1 million in bursaries to local students through its Million Dollar Bursary Program, invested over $8 million in support of local community programs and services and shared over $50 million in profits with members through its Member Rewards program. 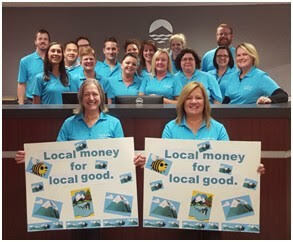 What started in downtown Kelowna 75 years ago with 20 founding members and a vision to create a local financial institution with heart has grown to 71,000 members and over $2.2 billion in assets. Now that’s a testament to the importance of purpose in business. To learn more about what it means to be a member of Interior Savings, visit www.localmoneyforlocalgood.com. BDO recognizes that we are only as strong as the companies and the communities we serve. That’s why the support of community events, and being a leader in community involvement is an integral part of our operations. We look to align with events, initiatives and organizations that build stronger, healthier, positive communities to live and work. Each year we eagerly invest in many community projects that are transforming the areas of education, youth, health & wellness, and economic development. We extend our support through corporate sponsorships, bursaries at Okanagan College, volunteerism, and other related support opportunities. Some of our larger community event partnerships include BDO Leadercast 2017 brought to you by the Kelowna Jaycees, BDO Kelowna International Major Midget Tournament, On the Lawn powered by BDO, BDO Top 40 Program, and the YMCA Cycle for Strong Kids. Our partners and personnel are also involved in numerous community outreach, social organizations, and volunteer efforts such as the United Way Day of Caring, Junior Achievement of BC, and the Kelowna Jaycees, and provide their time and expertise on the Boards of the Kelowna Chamber of Commerce, Central Okanagan Foundation, and several others. Making a real difference in our communities just feels good, and supporting our communities in this manner is leadership we can all get behind. Watching companies grow is what inspires John Glennon from Sandler Training every day. John believes that you must love what you do, in order to be truly successful at it and John loves working with and mentoring local business owners and their teams. Hearing their stories of success in today’s ever increasingly competitive and changing economic environment is what drives John each day. John is always available for his clients and students when they need guidance and leadership. “John Glennon at Sandler Training is an excellent sales trainer, coach and mentor. It is hard to describe the positive impact he has and continues to have on both my personal and professional development. He is unrelenting in his pursuit to better those that he works with and he truly goes above and beyond.” Mark W – Kelowna. John and Sandler Training believes that when you give to those around you and to your community you will reap personal and professional rewards 10 fold. In lieu of corporate gifts for clients every year John and Sandler Training donates to local charities like to the foodbank, tripling all donations from his students. An avid runner, John has inspired 3 of his students to return to running and raise money for the Vernon Starfish Program by entering a relay team in the OUC Half Marathon, matching all donations up to $2500.00. John feels a true leader leads by example not because you feel you should, but because it is your way of life. For more information on John and Sandler Training visit www.glennon.sandler.com or drop by and meet him at his booth at the event. Paradigm Mortgage opened for business in Kelowna 23 years ago and has been encouraging home ownership and supporting the community ever since. 2017 is an exciting year for Paradigm Mortgage as they are about to launch an update to their corporate brand and image, but what is sure to stay the same is their commitment to growing leaders within the company and encouraging their entire team to share that leadership in the community. From ringing the bells for the Salvation Army Kettle campaign, to participating in the United Way Day of Caring, to proudly winning the 2016 Kelowna Small Business Mentally Healthy Workplace award, Paradigm Mortgage, soon to be rebranded and known as Three Point Capital, has no plans to slow down. Three Point Capital will continue their leadership and support within the community, their team, mortgage brokers that encourage home ownership in our community as well as growing their family of shareholders and investors that will look to Three Point as a way to include diversified mortgage lending within their RRSP or TFSA portfolio. Leadercast, in partnership with the Kelowna Jaycees, is a wonderful way to showcase the impact that great leaders have on each of us. Paradigm and Three Point Capital value the opportunity to both sponsor and attend as they continue their commitment to support and embody leadership in the community. Alpine Consultants Ltd. is a land development consultancy serving private and municipal clients across the Okanagan and greater BC since 2012. Providing project management and design services for the optimization of re-developable land: master servicing, rezoning, subdivision, servicing agreement and development permit, Alpine provides professional, responsive and reliable service on-time and within budget. Alpine has used its expertise in order to advance a wide range of community interests: Silver Lake Camp, a fantastic kids camp in Peachland; Canstruction, a local design contest raising food and funds for local charities; Habitat for Humanity’s latest development/build project; and assisting in extending sanitary sewer to unserviced lots. Led by long-time Jaycee James Kay, Alpine is currently involved in several land development and economic development projects throughout the Okanagan. Positioning lands and advising municipalities on how to attract investment and development.